QUICK CONNECT "PLUG&PLAY" WIRING KIT REQUIRES NO SPLICING OF THE WIRES AND WILL PLUG INTO THE FACTORY CONNECTORS. PLEASE MAKE SURE THAT YOUR MODEL IS EQUIPPED WITH A FACTORY 7-WAY CONNECTOR. IF IT IS NOT YOU WILL NEED A DIFFERENT WIRING HARNESS AND HITCH/COMBO. This Product Fits The Following Vehicles. 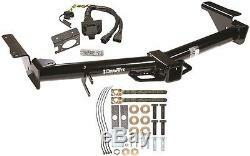 2003 - 2006 Lexus, GX 470, w/Factory 7-Way 2003 - 2006 Toyota, 4Runner, w/Factory 7-Way. OUR EXCELLENT FEEDBACK MIRRORS OUR CUSTOMER SERVICE. WE ALSO USE FED-EX GROUND INSTEAD OF US POSTAL SERVICE WHICH MANY OF OUR COMPETITORS USE. The item "TRAILER HITCH & WIRING KIT FOR 2003-2006 LEXUS GX 470 DRAWTITE CLASS III 2 TOW" is in sale since Monday, November 24, 2014.